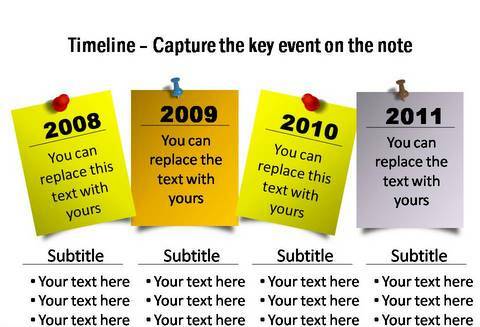 Take your presentations to the next level with these creative timeline ideas. Learn to express more with SmartArt tools. The one thing that differentiates remarkable business presentations from average presentations is – Great presentations don’t just show the events over time, but also show the significance of those events. Instead of just listing events, this layout helps you tell the story about your revenue growth. Notice the shape of the arrow. Instead of a flat arrow, an upward arrow signifies progression. The curved shape subtly captures the trend in growth. 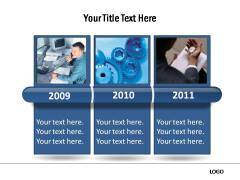 The layout helps you tell the story about how your company added new service offerings each year. Different colors signify different types of services. Every new piece added seems to fit nicely with the existing shape. This signifies harmony in the growth process. 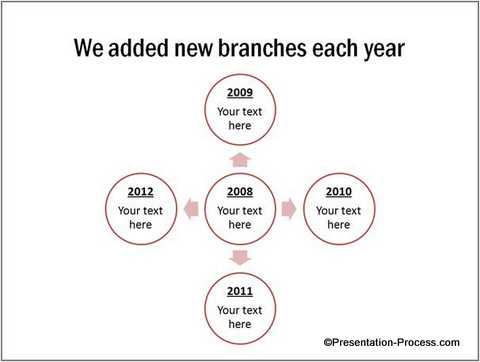 The diverging radial layout helps you express how you added new branches each year in all directions. Notice that the color scheme is consistent for all the circles, to signify replication of systems. The layout helps you say that you haven’t sacrificed consistency in your operations to achieve growth in numbers. This onion diagram layout helps you express the concept of concentric diversification. 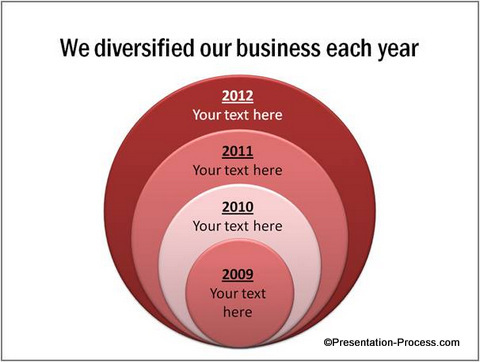 Using this layout helps you convey the story about how your company expanded in areas around your core strength. Notice that the color scheme used is just variations of one color. 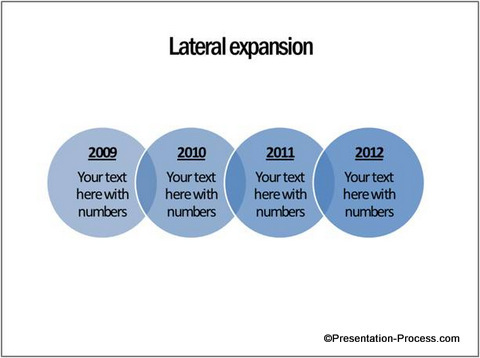 This reemphasizes the idea of related expansion. Thus, by going a little further than just listing down events, you can add a whole new dimension to the way you present information. 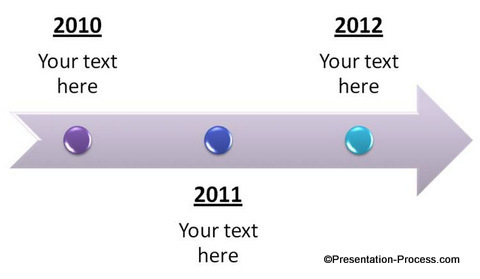 The layouts you use on your slides make your message clear and memorable. By now, you would have realized that it always helps to have more options available to express your ideas. 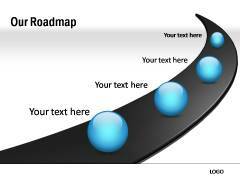 The number of options offered by SmartArt Timeline is not enough to help you express all your business ideas accurately. 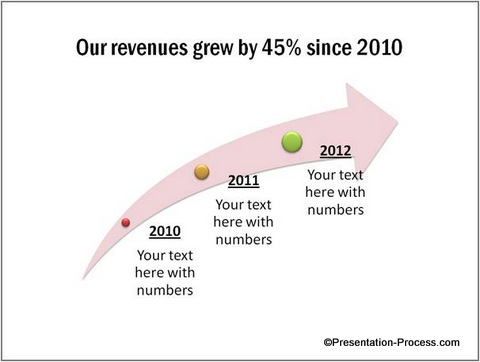 That is why we came up with our ‘750+ PowerPoint Charts and Diagrams Templates Pack for CEOs’. 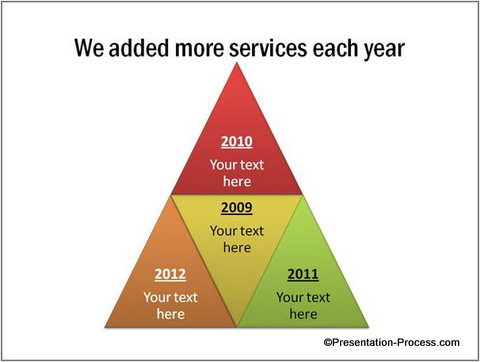 The pack has more than 750 fully editable diagram templates which you can copy to your slides. You can alter them to suit your specific needs. In fact, you can create your own set of diagram templates by picking elements from different templates. 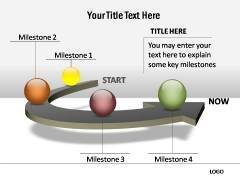 If you are a business presenter and have not seen our diagram templates pack yet, you are truly missing something. 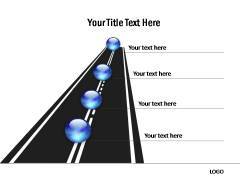 Please browse through our collections and see how our diagrams can change the way you create your presentations forever.